NASA's Mars rover Curiosity appears as a bluish dot near the lower right corner of this enhanced-color photo taken by the space agency's Mars Reconnaissance Orbiter on June 27, 2013. The rover's tracks are visible extending from its landing site in the left portion of the scene. A new photo by a sharp-eyed NASA Mars orbiter shows the agency's Curiosity rover wrapping up work near its landing site on the Red Planet before beginning the long trek to a huge and mysterious mountain. 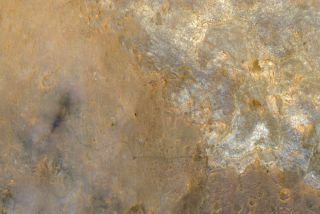 The 1-ton Curiosity rover appears as a small bluish dot in the bottom-righthand part of the image, which was captured by NASA's Mars Reconnaissance Orbiter (MRO) on June 27 and released today (July 24). Curiosity's tracks are visible in the photo as well. They snake back to a spot called "Bradbury Landing," where a rocket-powered sky crane lowered the rover to the Martian surface on cables on Aug. 5, 2012. The two bluish spots at left are areas where the sky crane's engines blasted the planet's iconic red dirt away, NASA officials said. At the time the new picture was taken, Curiosity was investigating a rocky outcrop dubbed "Shaler," its last science target near Bradbury Landing. On July 4, the six-wheeled robot headed out toward Mount Sharp, which lies about 5 miles (8 kilometers) as the crow flies. Mount Sharp has long been Curiosity's main science destination. The many layers of the mountain, which rises about 3.4 miles (5.5 km) into the Red Planet sky, record a history of Mars' changing environmental conditions over time. The rover team wants Curiosity to read this history like a book as it climbs up through Mount Sharp's lower reaches. It may take the car-size Curiosity a year or so to reach the base of Mount Sharp, NASA officials have said. There is no set timeline, as mission scientists plan to stop and investigate interesting features along the way. Curiosity's main task is determining if the Red Planet has ever been capable of supporting microbial life. It has already accomplished this goal, finding that a spot near Shaler called "Yellowknife Bay" was indeed habitable billions of years ago. Whether it was ever actually inhabited is a question for another day. As of Tuesday (July 23), Curiosity had traveled a total of 0.81 miles (1.23 km) on Mars.